Learn a few tips about how to buy a new AC adapter if your original laptop adapter breaks down. Yesterday, AC Adapter (commonly known as charger) of my laptop broke down and my work got stuck. AC adapter is a device that converts the AC current coming from power socket into direct current (DC) and adjusts the electricity to make it suitable for your laptop. I know it’s silly to say, but you never know! : Check the power socket to make sure that electricity is there. You can do this by plugging in another electrical device in the same socket and see if the device works. If socket is fine, then check the input cord, i.e. the cord which draws electricity from power socket and sends it into the adapter. Disconnect this cord from adapter and test the output end with multi-meter to see if the current is reaching there. If you don’t have a multi-meter or don’t know how to use one –its better you don’t apply any other method to test the input cord and assume that the cord is fine. If you don’t know what you are doing, do not play with electricity, it could be dangerous. Just go and buy a new charger. If you believe that the input cord is fine, problem lies in the rectangular adapter box. You may have the urge of opening the adapter and see if something is loose inside. But this is not advisable because once opened you cannot close the adapter again! The adapter case is made in a way that provides no way to open it in a civilized manner. You’ll have to break it open! 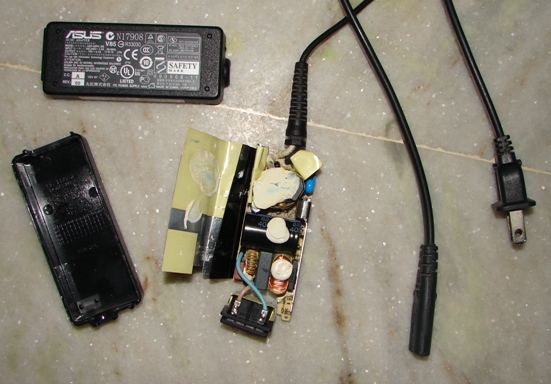 To satiate your curiosity, here is the photograph of the innards of my AC adapter after I broke it open. Opened charger (AC adapter) of my laptop. I searched on shopping websites (like Amazon and eBay) to see if the same adapter was available. My ASUS laptop is about 2 years old and I could not find its adapter on these websites. However, a few similar ones were available. Then I went to a nearby ASUS showroom. They also expressed their helplessness as the same adapter was not available with them too. In the end, I asked at many local “laptop/desktop repair” shops. One of these shops had a similar adapter. I bought it for Rs. 350 (US$ 7) along with the input cord. My original adapter was giving an output of 19V/2.1A and the new one I bought is 19V/1.58A. This new adapter is working fine. The shop gave me a 3 months warranty as well. Purchase it from the store of the original manufacturer. Try to get the adapter that has the same item number as that of the original one. Always take your laptop along to the shops –and check if the plug of adapter you are planning to buy fits in your laptop. Buying an adapter online should be the last resort for two reason. First, it takes a few days to come to you. Second, you cannot see if the adapter’s plug is fitting in your laptop. Photos of adapters shown on shopping websites are not always of the exact model that they are selling. I hope this article was of use in your quest for a new charger for your laptop. Please share if you have any more tips in this regard. Also, feel free to ask if you have any questions. I will try to answer and help you. Thank you for using TechWelkin! I did some research and found that the tension (Volts) is ok to vary 5%. So 18,5V or 19,5V will also work. Current (Amps) should be same or higher. Lower current is not recommended as it can heat up the adapter and fail. Thank you for this information, Chris! Another helpful information: there is one sensor tester available in market (It’s only available in one or two shops in Lajpat Rai) – which I had first time bought from some electronic fair in 2003 at Pragati Maidan. This senses the break in wire without touching anything. You just have to take it near the energised wire and it would pin point the exact point where there is a break. Helpful to check whether the input lead is defective or the output lead.